This rhubarb dessert tastes light and has just the right balance of sweet meringue, rhubarb filling with a thin shortbread crust. 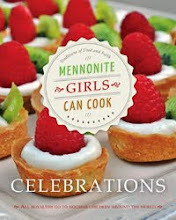 It's great for bringing to a potluck as it will serve 18 people. Blend all ingredients together in a food processor or mixer and pat into a 10 X 15 cake pan. Bake at 350 F for 10 minutes. Put rhubarb evenly over the baked crust. Sprinkle evenly with tapioca. Beat together egg yolks, sour cream, whipping cream and sugar. During the last few minutes of baking time, mix together cornstarch, 2 tablespoons sugar and water in a bowl. Heat in microwave until clear and bubbly. Alternately, mix in a small pot over medium heat and stir until clear and bubbly. Whip egg whites in a large bowl while slowly adding in the 3/4 cup sugar. When the egg whites start to form soft peaks, add the cornstarch mixture and beat until stiff. Smooth meringue over the hot rhubarb filling. Reduce oven temperature to 325 and bake for 20 minutes or until the meringue is lightly browned on top. Turn off oven and leave dessert in for another 20 minutes. Cool and cut into squares using a wet sharp knife. Refrigerate until ready to serve. Can you go wrong with pineapple and coconut in a pie, I think not. Drizzle a bit of glaze on top or serve warm with ice cream and you have a delicious dessert to serve your guests. Prepare your favorite pie crust, enough for a 9" double crust pie. Roll out dough to fit a 9" pan and sprinkle with coconut. Drain crushed pineapple, reserving 1 tablespoon for glaze. Whisk together sugar, flour, salt, lemon juice, melted butter, and drained, crushed pineapple and pour over coconut layer. Roll out pastry for top crust and place over filling. Trim and crimp edges. Cut slits in pastry. Bake in a 400º oven for 30 to 35 minutes, until golden in color. Drizzle over warm pie. Serve warm or cold. Since I had made a larger recipe of pie dough than I needed, I used the rest of the dough to make tart shells. I love the simple way of draping the dough over an upside down muffin tin before baking. How easy is that? This is one of those recipes, that once you see the idea you can basically do with it as you like and stuff it with your regular lasagna recipe, omitting the pasta, which is kind of ironic since the pasta noodles is what makes it lasagna. Whichever way you look at it, it is a delicious alternative. Preheat oven to 400 F. Cut the squash in half lengthwise and scoop out the seeds. Lay 4 halves cut side down in a large roasting pan, with about 1/2 inch of water. Cook for 45 minutes, until soft when pricked with a fork. Remove from pan and cool slightly. Meanwhile, brown beef in skillet. Stir in the onion and garlic and cook until onion is soft. Add salt, tomatoes and spices. Allow to simmer for about 30 minutes. Scraping with a fork, scoop out squash to within about 1/2 inch of shell. It will come off easily in strands like spaghetti. Leave some as a bottom layer. Collect the rest in a small bowl and set aside. Drain roasting pan, wipe out and spray with oil. Place shells inside. Divide feta cheese mixture among the shells. Follow with a scoop of meat sauce and then some mozzarella cheese. Follow with a layer of shredded squash. Mix the rest of the shredded squash and meat sauce to add another layer. Finish off with mozzarella cheese. Cover roasting pan with lid and bake at 400 F for 15 minutes. Uncover and bake another 15 minutes. This is a dressing recipe I got from my sister Rhoda, and I get great comments and requests for the recipe. It's a simple combination of purchased dressing and a few pantry and fridge ingredients. Dressing will keep well in refrigerator for 2-3 weeks. Mix all ingredients together in a jar and shake well. Refrigerate for several hours to allow flavours to blend. Make salad and drizzle dressing over just before serving. Salad mix that I like to use when serving the above dressing. and the melody of a lyre. You thrill us, LORD, with all you have done for us! We sing for joy because of what You have done. But You have made us as strong as a wild ox. You have anointed us with the finest oil. our ears have heard the defeat of our wicked opponents. For they are transplanted to the LORD's own house. 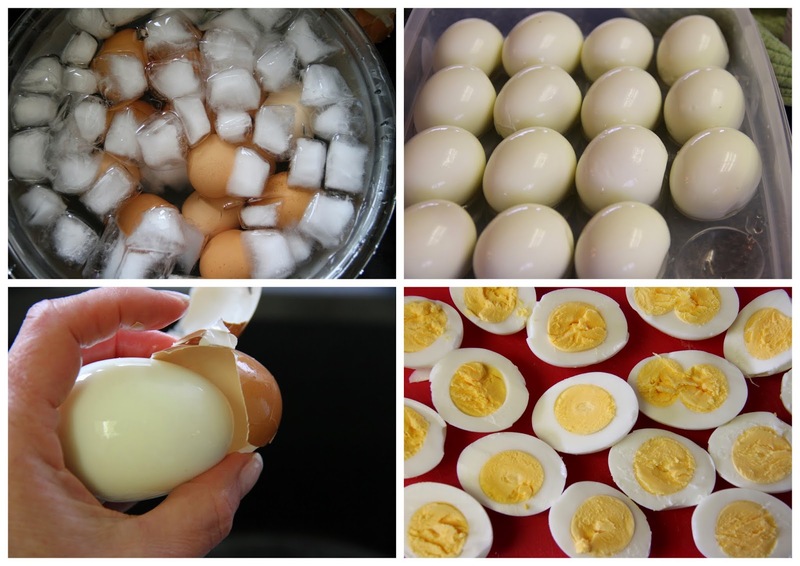 If you have ever gathered eggs from your hens in the morning with the hope of hard boiled eggs for lunch, then you will surely want to take a look at how easy it is to peel those eggs. The eggs pictured in the photo were cooked the same day they were laid. Have the eggs at room temperature. Bring a pot of water to a full boil. Be sure to have a large enough pot to have several inches of water covering your eggs when they are in the pot. Place eggs into a large sieve, a few at a time and very gently place them in the pot. Do not let them drop, hitting the bottom as this could cause the eggs to crack. You could use a spoon to place them but to ensure they are all cooked evenly, you want to get them all into the pot relatively quickly. Set the timer for 15 minutes, continuing to boil eggs. Stir the eggs ever so gently every few minutes to keep the yolks centered. While the eggs boil, prepare a bowl with ice cubes. At the end of 15 minutes, drain eggs and dump them into the bowl with ice. Cover with water. Stir to be sure all the eggs are being chilled evenly. Once the eggs have cooled, tap the wider end to crack it and peel. For flashback Friday I am bringing back my shnetchi recipe. These shnetchi are very good served with jam, honey, or Roger's Golden Syrup. This recipe was passed down from my Dad. 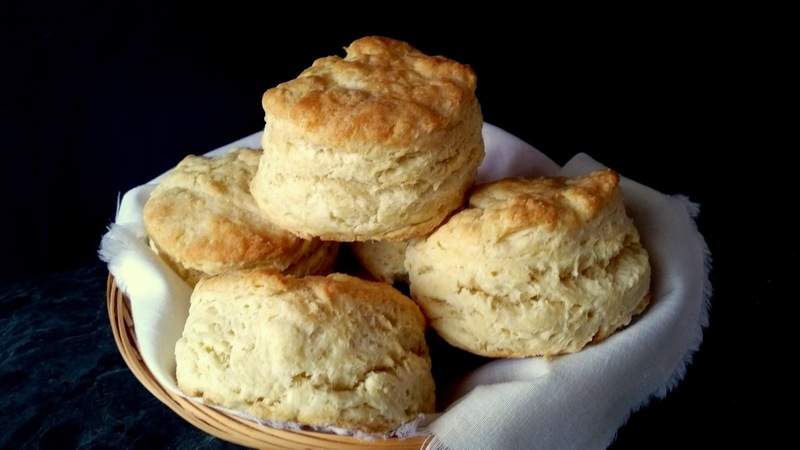 He told me to always use whipping cream, although I sometimes use buttermilk and they turn out great too. My Dad used to have a shnetchi booth at the Mennonite Heritage Village Museum during Pioneer days. His booth was called 'Uncle Knals Shnetchi'. Cut in butter with pastry blender until crumbly. Make a well in dry ingredients, add cream and beaten eggs. Using a fork stir together just until mixed. Don't overwork the dough or the biscuits will be tough. Gather dough into a ball and pat out on counter to desired thickness, 3/4" to 1" thick. Cut with round biscuit cutter or whatever shape you want. Place on pan and bake in a 400º oven for 15 minutes or until golden in color. This is a simple appetizer with a pretty presentation. 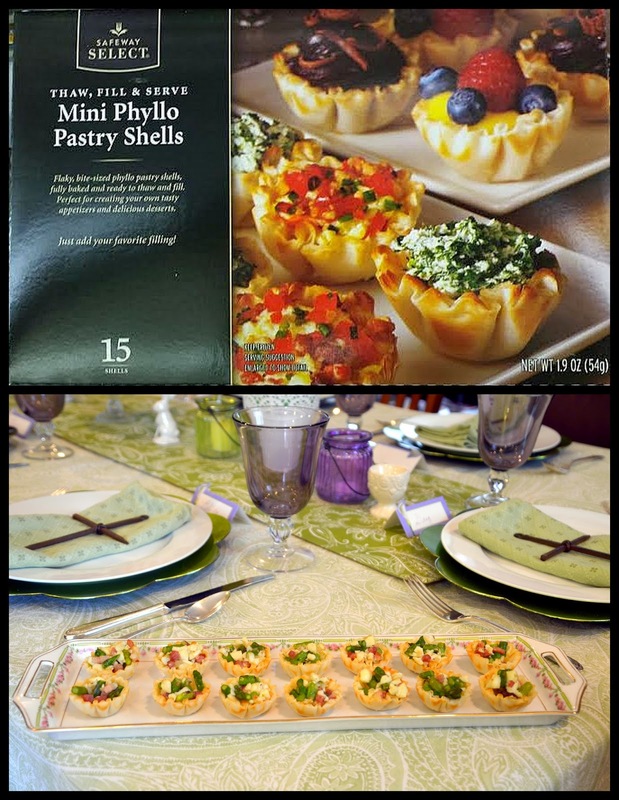 I used mini Phyllo cups that come frozen in the freezer aisle of the grocery store. The sky is the limit on what filling combination you could use. We had these at Easter so the Asparagus was my go to choice with added ingredients that I thought would go well together. 15 stalks of Asparagus, washed and chopped into small pieces. 2 egg whites from 2 hard boiled eggs, chopped. Discard the yolk. Defrost the Phyllo Shells in refrigerator overnight. In a saucepan, melt the butter on medium heat and cook the asparagus for 2 minutes. Set aside in a bowl. In the same saucepan, cook the chopped shallot for 2 minutes. Add the white wine vinegar and reduce by half again. Add the chopped egg white solids to the Asparagus bowl. Mix gently and season with salt and pepper. If you want to add the grated cheese do it now and mix gently. Place thawed Phyllo shells on a cookie sheet that is large enough for the 30 shells. Fill each cup full with the Asparagus mixture. Bake in 350 degree oven for 10-15 minutes. Just long enough to warm all ingredients through. Set out on pretty plate and watch them disappear! This recipe was shared with me by my friend Renee who got the recipe from her dear mother by love Elizabeth Strempler. This is a wonderful sauce to pour over the cottage cheese perogies and cream sauce (Schmaundt Fat), it raises perogies to a whole new level. 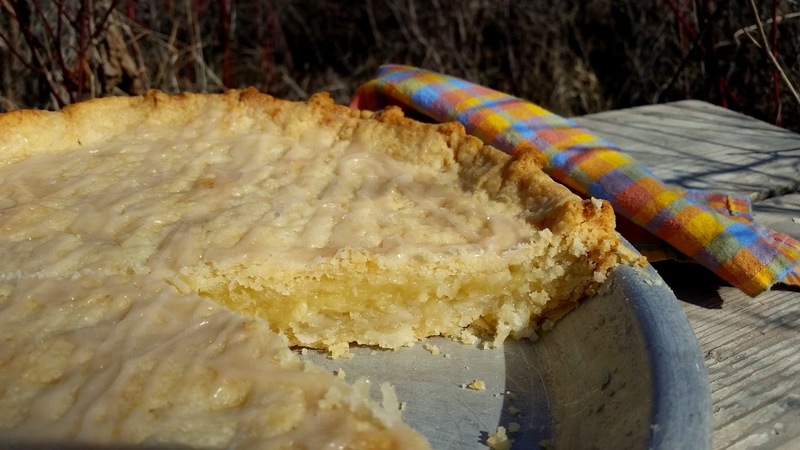 Thank you Renee for sharing this recipe and your family tradition. It was a lot of fun enjoying a meal after making so many perogies together. It is way more fun making time consuming recipes like vareniki with friends. Cut up the plums in bite size pieces. Combine the sugar and tapioca and sprinkle over the plums and let sit for 20 minutes. Bring to a boil and cook on medium heat for about 5 minutes. Cool the sauce and freeze in desired portion sizes. To serve, thaw sauce and heat gently til warm. Pour over vareniki and cream sauce. On medium heat, melt the butter in a saucepan or frying pan. Add the flour and stir together with a whisk cooking until a the flour begins to change color. Pour in the cream and milk and cook until bubbly, stirring frequently with the whisk to prevent lumps. When the sauce is smooth and thickened it is ready to serve, it takes about 3 minutes. If you desire to use all cream or all milk that is just fine. A friend of ours said he had ordered wild rice pancakes in a restaurant and had really enjoyed them. He wondered if I could make them. That intrigued me so went in search of wild rice in my cupboard. All I had was a wild rice blend which worked just fine. 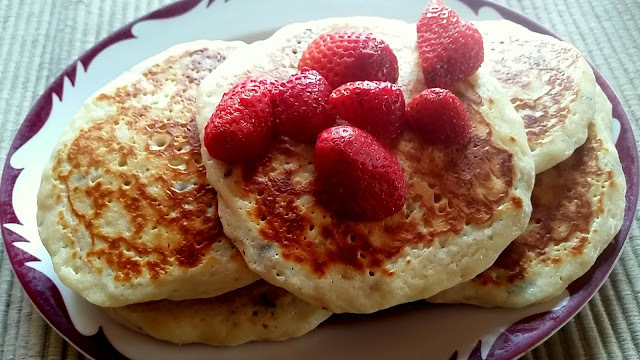 These pancakes turned out nice and fluffy with a bit of a nutty texture and flavor. Delicious drizzled with pancake syrup and served with a side dish of strawberries. Whisk together eggs, buttermilk, and vanilla. Slowly add dry ingredients to the wet ingredients just until combined, stir in melted butter and cooked rice. Heat up your lightly greased griddle to medium high heat. Using a small ladle, scoop batter on grill. Cook 2 minutes or until golden in color. 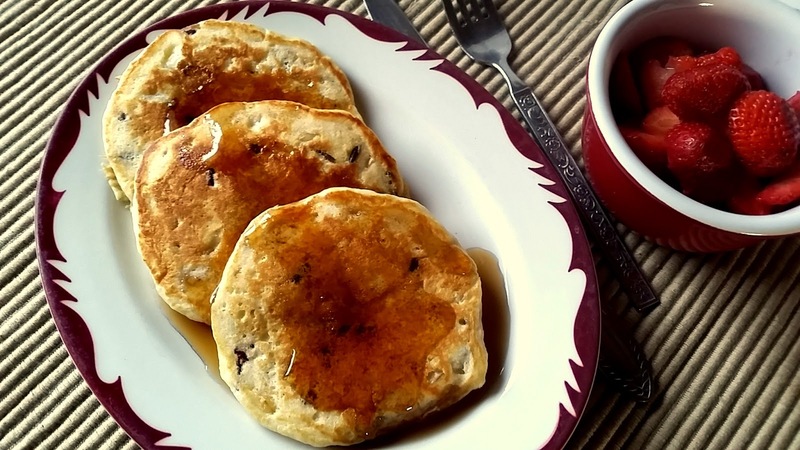 Flip pancakes and cook another 2 minutes. Serve immediately, at least that is how we like them. When we can't move those 'mountains' in our life we know that God can. He takes us as we are with all our fears and failures, all we need to do is surrender to Him. "The LORD your God is in your midst, a mighty one who will save; he will rejoice over you with gladness; he will quiet you by his love; he will exult over you with loud singing." 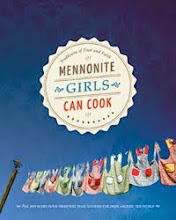 I got this recipe from my friend Elsie who has been making perogies for generations. She too got the recipe from her mother and her mother before that. As usual, the recipe said "add enough flour to make a soft dough". 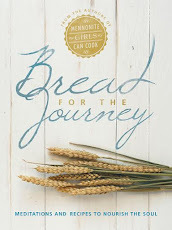 Her daughter Lorrie, who is also one of my dearest friends, took the time to measure each ingredient out to make it perfect so she can pass the recipe and tradition on to her children. Elsie says, the best recipes are the simplest recipes, and she was right! In our grandmother and great grand mother's era they didn't have the luxury of rich ingredients available to them at all times. These ingredients make a soft and elastic dough and I did not have one perogy open while boiling. Follow the recipe exactly and you won't have any trouble. Thanks Lorrie for perfecting the ingredients amounts saving us all the trouble of figuring out what a soft dough means. NOTE: This dough has no dairy in it, there for it has a bit more of a "chew" or "bite" to the texture when you eat the finished product. Using dairy like milk, cream or sour cream makes the dough more tender and has a softer bite to it. In a large mixer with a dough hook attachment add 8 cups of flour to the mixing bowl. Can easily be done by hand if you don't have a mixer large enough to make dough. Heat the water til it is almost too hot to touch or hot water from the tap. Add the oil and the hot water to the flour, knead the dough for about 5 minutes in the mixer or ten minutes if you are doing it by hand. Let the dough rest for at least an hour or more on the counter. Divide into 4 balls to make the rolling of the dough easier to manage. Cover the remaining dough with plastic wrap to keep from getting a dry outer crust. On a lightly floured surface, roll the dough thin, cut in circles or 3 inch squares. Place the prepared perogies on parchment lined cookie sheets. Can be frozen at this stage if you desire. Once completely frozen place them into ziplocked bags. To cook, have ready a large pot of boiling water. Place perogies into the water without crowding too much and boil for a few minutes. Once they float to the top boil another 3-5 minutes. If you are cooking them frozen, cook about 8-10 minutes. This amount makes about 15 dozen 3 1/4 in circles. For 1 recipe of dough, I used 2- 650 gm containers of dry cottage cheese (3 cups), mixed with 2 eggs, salt and pepper (optional) as desired. Tip - I use a round cutter to make cottage cheese, cut 3" squares for the potato and cheddar cheese filling and shape them into a triangle, and shape the squares into rectangles or squares for the fruit filling, so there is no guessing as to what they are filled with. Plus cutting them in squares means no rolling and re rolling. For filling ideas check out Kathy's suggestions here. Try to pinch them a little fancy for that special someone, or if you have four options of a variety of perogies. 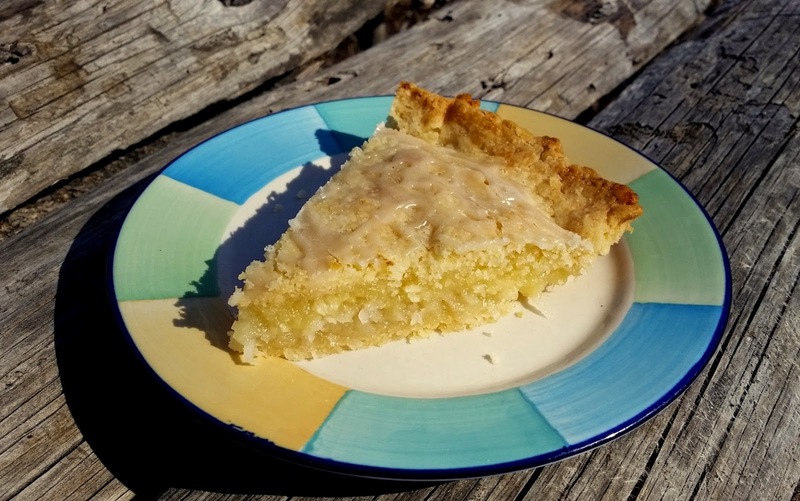 For this Flashback Friday recipe I'm re-posting Napoleon Torte, which I grew up knowing as Blaettertorte, literally translated, cake with leaves. In this cake the pastry gets divided and rolled out into plate size cookies, baked and then stacked with a custard filling. This recipe yields two cakes, which is great because you can fill one cake and freeze half of the baked pastry leaves/cookies for another time. Beat sugar and eggs well, then beat in the soft butter and milk. Combine dry ingredients and stir into first mixture. Turn dough onto floured counter to shape into a log. Wrap or cover and refrigerate for a couple of hours. Prepare 3 large cookie sheets with shortening and then flour. Tip sheet slightly and tap so that flour covers evenly. No need to repeat after first use. On lightly floured surface, shape each slice into a circle, then roll out to barely the size needed - use an 8 inch salad plate or bowl to cut circles. The first one is the hardest and then you can add the left over to the next one etc. Use the rolling pin to roll up, lift and unroll onto prepared sheet. Try not to move cookies by hand because you will stretch them – use a spatula to move or tilt and tap the sheet. Place 2 at an angle to fit or bake one at a time. Bake at 400 F for about 5 min., until very light golden in color. Allow to cool on sheet until cookies harden, (5 min) then transfer gently, using spatula, to cooling rack. Re-use the same sheet, without washing, for another set. Keep a few in rotation mode. Bake leftover strips (cuttings) to use for crumb topping. It takes about 1 hour to roll out and bake 10 - 12 cookies. To freeze, stack in a round Tupperware or plate with a topper, using wax paper between each layer and paper towels around the stack to cushion. Sometimes, after freezing there may be some cracks, but with correct handling, they will never show once the cake is assembled and set. The traditional way is to fill 5 - 8 layers with vanilla custard. In our family we sometimes opt for chocolate pudding. In medium sized pot, bring 4 c milk to boil using just below med. heat. Meanwhile, in a small bowl or 4 cup measuring cup, mix cornstarch, flour, sugar, vanilla and 1/4 c milk. Add egg yolks, blending them in well, then 3/4 cup milk, gradually, stirring to make a smooth, thick liquid. In mixing bowl, beat 1 cup whipping cream with 1 tsp sugar until gentle peaks form, then add cooled custard/pudding, beating on low until mixed well for about half a minute. Put a small amt (1 Tbsp) of pudding in the center of a flat serving plate. This is to keep the cake from slipping around while you try to layer it. 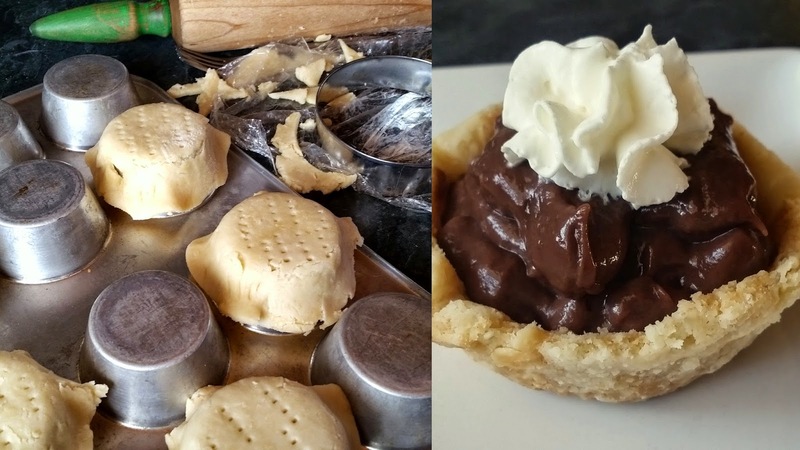 Using a large serving spoon, cover first layer with about ¾ - 1 cup pudding and repeat four or five times.There may be some wobble if the cookies are not very even - make up for it by the way you place them on top of each other – rotating fat end over skinny end etc. Cup sides with one hand as you spread the pudding. Use the leftover pudding to cover the sides, if you like. Sprinkle with separately baked cookie crumbs. Cover and refrigerate at least 10 hours. It will take a few hours for the cake to set, during which time you can help it along a bit. If it leans, place something under one side of the plate. Best after 24 or 48 hours. Keeps (refrigerated) for up to a week. Who said a birthday cake must be loaded with sugar and whipped cream? Here's a savory cake that served the purpose just fine! I invited friends for dinner with plans of serving birthday cake for dessert...but then the birthday girl said she would bring dessert. So I served the cake for the main course. 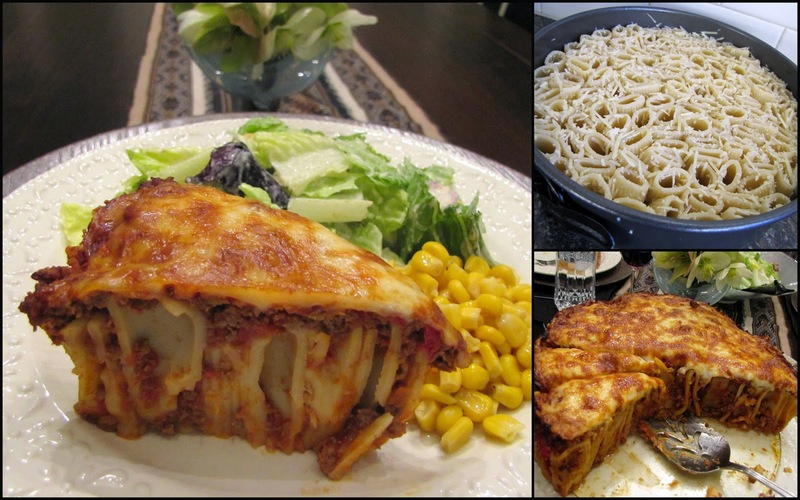 The pasta cake was an idea I saw on-line...where there are many versions to choose from. I used rigatoni...though I think I will try a spaghetti cake next time. It's a fun way to serve an Italian classic...for kids of any age to enjoy! In a large pot of salted boiling water, cook pasta until slightly underdone (about 2 minutes less than the indicated time). Drain; rinse in cold water and drain again. Toss pasta with 1 tablespoon olive oil and set aside. Heat the remaining tablespoon of oil in large skillet over medium-high heat. Add the ground beef and cook until it's browned, about 5 minutes. (Use a potato masher to break up the lumps of meat while sautéing.) Add the garlic, salt and pepper. Sauté another minute. Add pasta sauce and heat through. Toss pasta with Parmesan cheese. Sprinkle mozzarella cheese on top and bake another 15 minutes...until cheese is browned and bubbling. Remove from oven and let stand for 15 minutes. Run a knife around the edge to loosen and then un-mold. 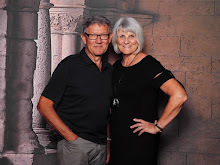 For my recent "milestone" birthday, my husband took me on a Jamaican holiday. This upside down cake ring reflects the flavours we enjoyed there - pineapple, orange and coconut. In a bowl, combine all topping ingredients and mix well. Prepare a baking pan. I used a ring shaped spring form pan which I lined with parchment paper to keep it from dripping in the oven. If possible, use a 9 inch ring shaped pan. If you don't have that, you may use a 10 inch cake pan. Spread topping evenly in the bottom of the pan and set aside. In mixing bowl, beat butter until fluffy. Add sugar and beat again. Add eggs, one at a time, beating between additions. Add vanilla and marmalade mixing until blended..
Add dry ingredients alternately with milk and mix until batter is thick and smooth. Bake at 375º for 30 - 35 minutes or until cake tester comes out dry. Remove from oven and let stand on counter for 5 minutes. Invert pan on to a serving dish and let cool. Sliders are just a mini sandwich. Before Easter I saw a few recipes for ham and Swiss and thought I'd make a copy cat recipe with our left over Easter ham. The ham disappeared before I could make these so I used deli style sliced honey ham. When I make sliders of any kind I usually make my own slider buns, but they can be found in most grocery store bakeries. These warm little sliders make a great light meal served with a salad, or serve them at the next game night. In a small bowl make a spread by stirring together the mayonnaise, first amount of Dijon (1 tsp) and sugar. Slice open slider buns and spread both sides with spread. Place a slice of Swiss cheese, then ham, then another slice of cheese. (Swiss cheese slices are usually large, so I cut them to fit the small buns) Place the top of the slider buns on top. Place filled sliders close together in a low casserole or pie plate. Melt butter, stir in remaining ingredients. Stir well to combine and spoon this poppy seed butter mixture over sliders. Cover with foil and bake in 350º oven for 15 minutes. Remove foil and let bake for 2-3 more minutes. Serve immediately. This is one of our family favorites and often requested for birthday meals. It is such an easy recipe and can become one of you favorites as well. I like to use boneless chicken thighs because it is economical and they don't dry out. This serves about 10 people with 2 pieces each. Pour the pasta sauce into the bottom of 2 9x13 pans. Dip the thighs into the egg mixture. Then into the combined cheese and bread crumbs. Brown in a bit of olive oil on medium heat. Place the browned chicken on the sauce. Add desired amount of grated mozzarella cheese and bake for another 10 minutes. Serve with your favorite pasta, greek or caesar salad and garlic bread. Because You died and rose again. In all I do, I honor You. But what if we were to visit a place where there was no such a feeling of kinship? What if everything was strange? 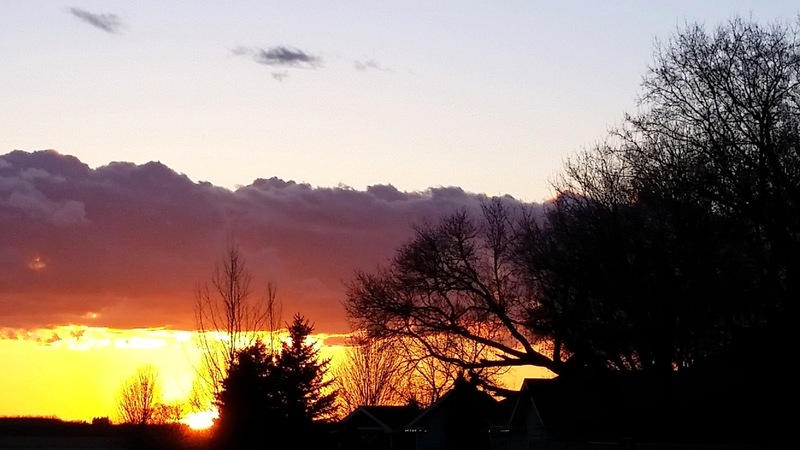 In this week after Easter, a friend passed along a thought or a question regarding the verse where the angel at the tomb asked the women, "Why do you seek the living among the dead?" I don't know if I'd ever really considered the question in more ways than what the context implies, but this time I saw it in a new way. My prayer today is that in our search for answers, with our attention being pulled in many directions, we will fix our eyes on Jesus, the One who is no longer in the grave but interceding for us at the right hand of God. He is for us! This cake is one of those favorite birthday cakes that many of the Europeans enjoyed. When my husband tasted this cake while visiting the Calgary Cousins, he asked whether I thought I could make him one. I took on the challenge and have been making this for him annually. Bake a simple sponge cake and yes, you can bake this in a round pan, but I prefer to use the loaf pan so that I can cut it into slices and freeze it. I invited Frieda Bartel, a pro at baking cakes, for a lesson on cake baking...three simple steps. Mix yolks and sugar at high speed for 5 minutes. Add vanilla, baking powder, flour and cornstarch. Whip egg whites till stiff and fold into cake batter. Grease the bottom of your pan and dust lightly with flour. Pour sponge batter into your cake pan. Turn the cake pan over and let it hang upside down for 40 minutes. Cut cake into two layers. Spread whip cream over one sliced layer. Spread whip cream over loaf. Burnt Almond Mixture: Step Three. This is the real secret to this cake. Immerse almonds into hot water for 1 minute, to avoid nut crumbs flying all over the place. Chop coarsely and evenly. Add almonds into a frying pan and add 2 cups of sugar. Stir slowly in the frying pan at med-high heat, until all the sugar caramelizes and turns brown. Rotate the heat from med to med-high over the next 45 minutes. It needs to be done slowly, otherwise, the sugar will not caramelize. This process is what makes the cake special and as you can see, it takes.....TIME! I had enough nuts left over to make another cake for a later time. I just froze them. 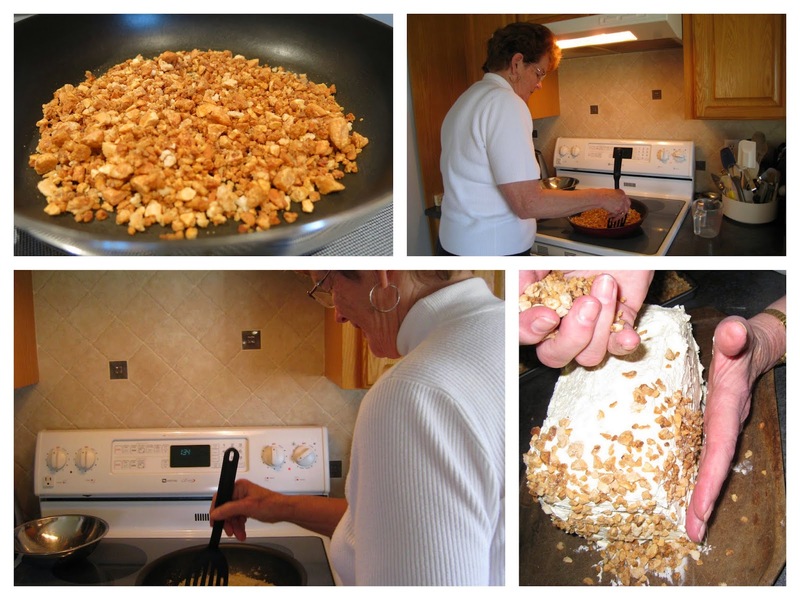 Frieda carefully showed me how to stir the almonds to make sure they were the right texture and then how to apply them to the cake. 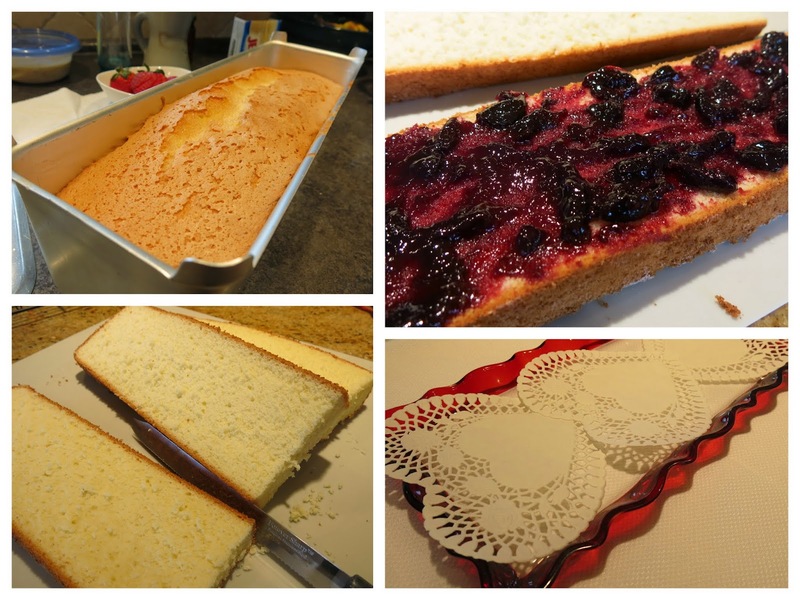 Make your simple sponge cake recipe, or buy a cake mix. Remember to turn the cake upside down to cool for 40 minutes. Slice cake into two layers. Whip two cups of whipping cream and add 2 tablespoons instant vanilla pudding. Spread the first layer with whip cream mixture. Spread the middle layer with tart raspberry jam. Spread remaining whip cream mixture over the entire cake. Spread burnt almond mixture over the entire cake. It's always fun to cook with someone else. You learn so many life lessons. I love her last words of advice to me. Thanks Frieda. "Marg, learn to buy cake mixes rather than thinking you need to do everything from scratch....The results are the same and no one knows." Some of us girls and our husbands got together for an appetizer and dessert evening last month at Anneliese's place. We all brought something to add to the buffet of amazing food. My contribution was this Artichoke and Spinach Dip. 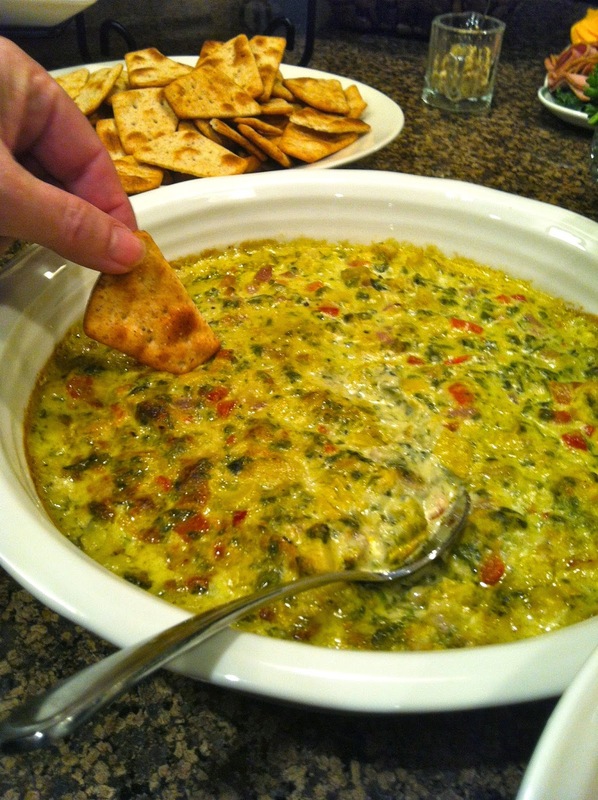 This dip can be made the day before and heated before serving. Heat oil in a large heavy skillet. Add garlic and onions and saute over medium heat until they begin to sizzle but not brown. Add spinach and cream. Stir and cook until spinach wilts and cooks down. Add salt, pepper and lemon juice. Cut cream cheese into small cubes and add to the creamed spinach mixture, stirring until cream cheese has melted. Remove from heat and add artichokes, roasted red peppers, and remaining 2 cheeses. Stir well until cheeses have melted. Pour this mixture into a low oven proof dish. Bake at 375º for 20 minutes or until dip is hot and bubbly. Serve hot, with pita chips or crackers. This is a simple stove top meal with good flavor. It would be good served with pasta on the side. Stir together tomatoes, cheese and basil in medium bowl and set aside. Combine tomato sauce and garlic in large skillet: add chicken. Bring sauce to a boil over medium-high heat. Add the mixed tomatoes, cheese and basil evenly on top of the chicken. Cook for 15 minutes or until chicken is cooked through. Top with croutons and more cheese if desired. Serve hot with pasta or another side dish. You can use boneless skinless chicken breasts instead of the tenders but you will need to pound them to a 1/2 inch thickness. Do you have leftover mashed potatoes from your Easter weekend festivities? 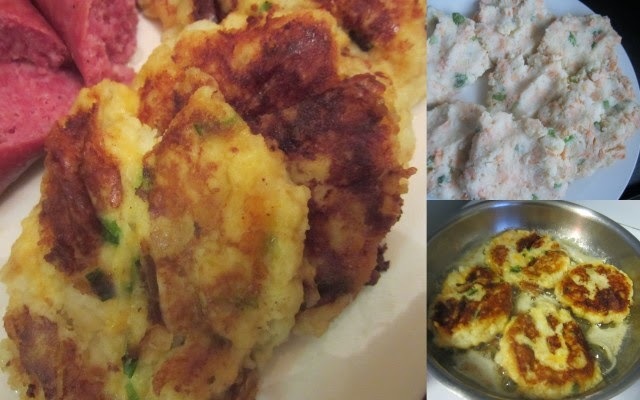 Often towards the end of the week my mom would use up the leftovers and on occasion she would make these potato pancakes using mashed potatoes. She didn't usually add cheese, I did. Isn't everything better with a bit of cheese? Combine all the above ingredients. Brown in a bit of oil on medium heat. Serve with sour cream and or ketchup. This winter when we were in Texas we always went to eat at the same chicken place every Sunday after church. We fell in love with their salad served in a tortilla bowl. It was filled with rice, beans, lettuce, grilled chicken, pico de gallo, cilantro, sour cream, cheese, and with salsa and a lovely creamy cilantro dressing on the side. 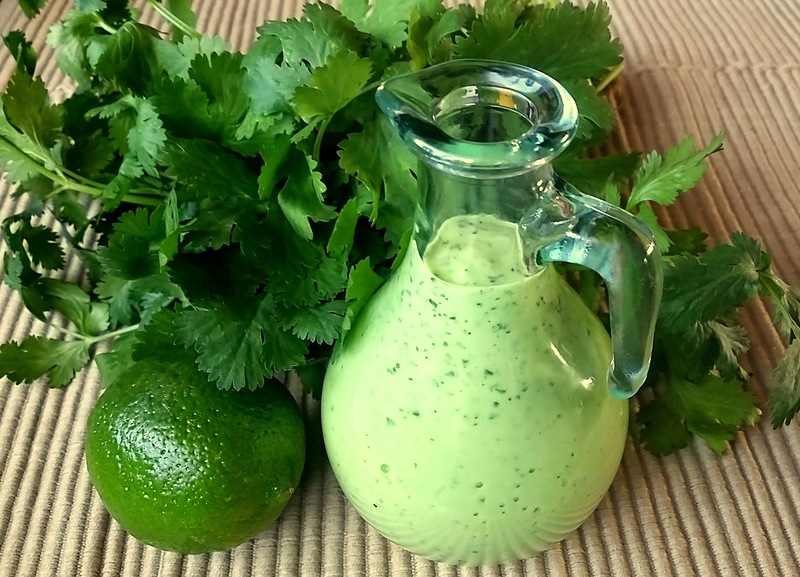 Once home I immediately made this cilantro dressing. It is a little different in taste from the restaurant but wonderful all the same. I tried to replicate the salad as I remembered it. I didn't have the tortilla bowls but served the salad with tortilla chips which was quite tasty too. Put all ingredients in the blender or food processor and blend until smooth.